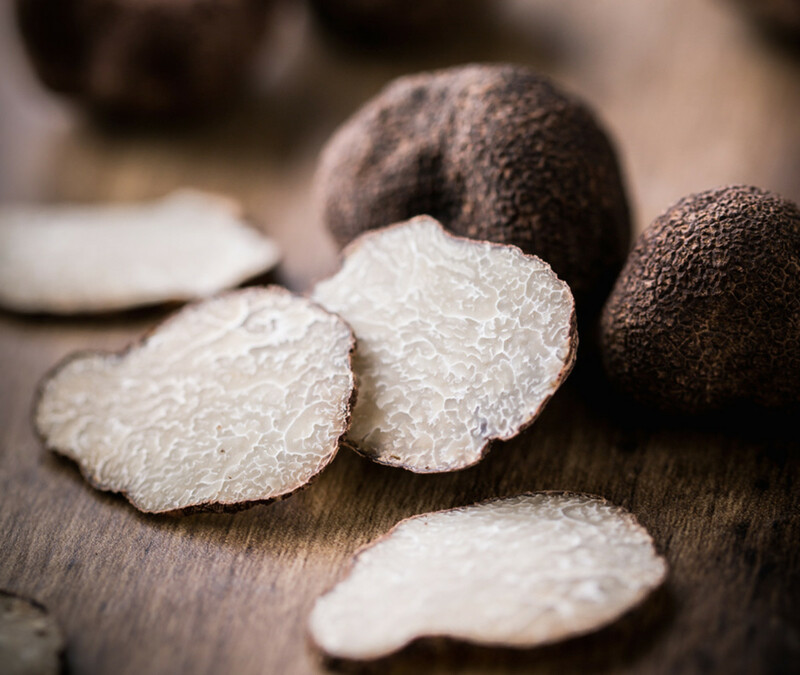 These black diamond-shaped morsels of culinary delight - Tuber Aestivum to be exact - make their appearance from May to August under the rolling Italian hills of Umbria. 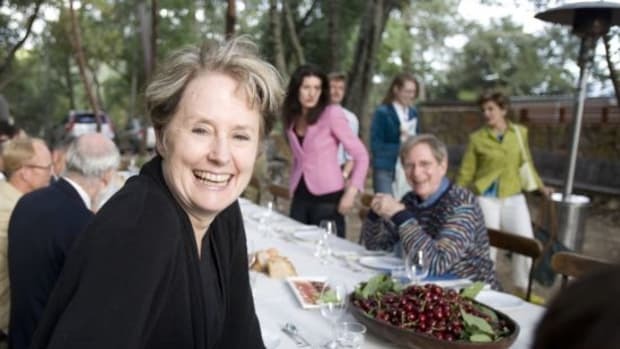 Near the medieval hill towns of Orvieto and Città della Pieve, you’ll find Poggiovalle Country House and Farm Estate, which is geographically ideal for black truffle hunting. With over a 100 hectares of rolling hills, cypress trees, olive groves, and restored Italian villages,the landscape is a feast for the eyes. 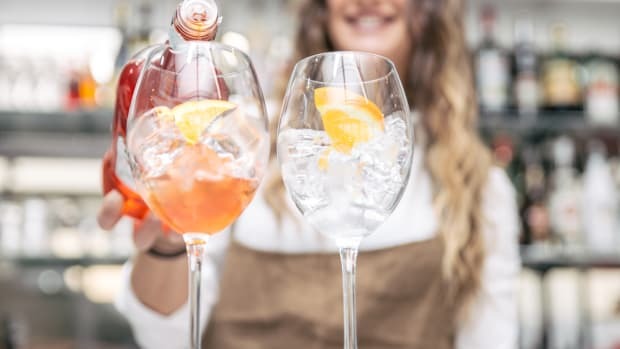 Cristiana was as naturally effervescent as Italian spring water. 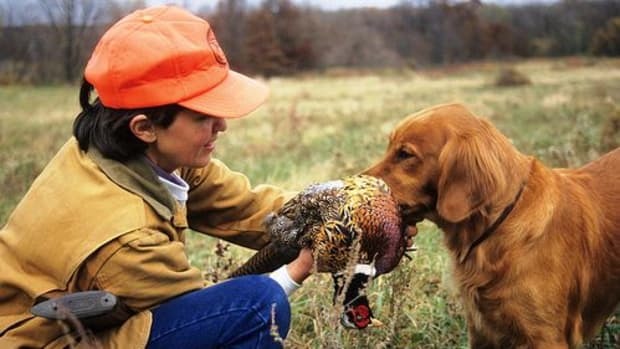 She warmly introduced us to Nazareno, our truffle hunter, who carries on the family tradition since 1925. Behind him were the dynamic duo, his expertly trained dogs. 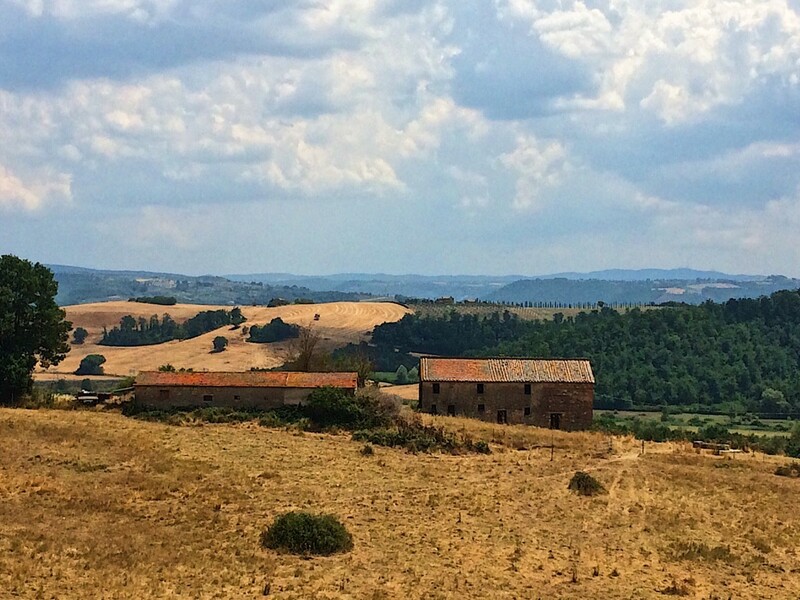 We set off, not into a misty forest, but into the hot and dry countryside under the Umbrian sun in sundresses and sneakers. Nazareno looked to the earth for scorched areas with no plants growing from the soil. 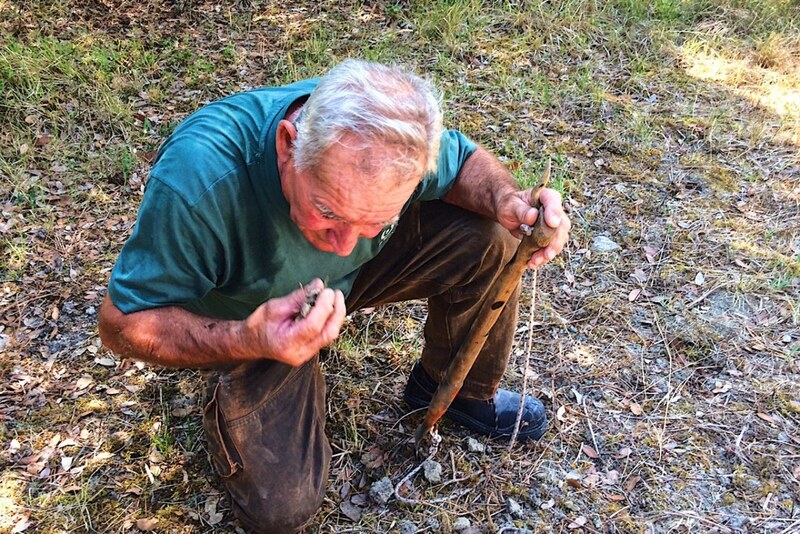 He pointed out the Quercia, Pino, and Elce trees where there were (almost) certain to be a treasure chest of black summer truffles. 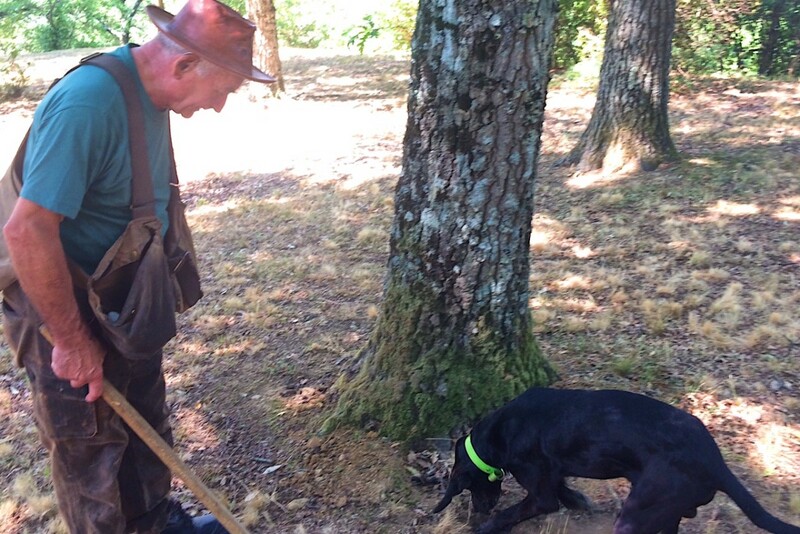 Truly, I thought truffle hunting would be more labor intensive. But Nazareno and his expertly trained dogs did all the work. We just relaxed and enjoyed the fascinating show. 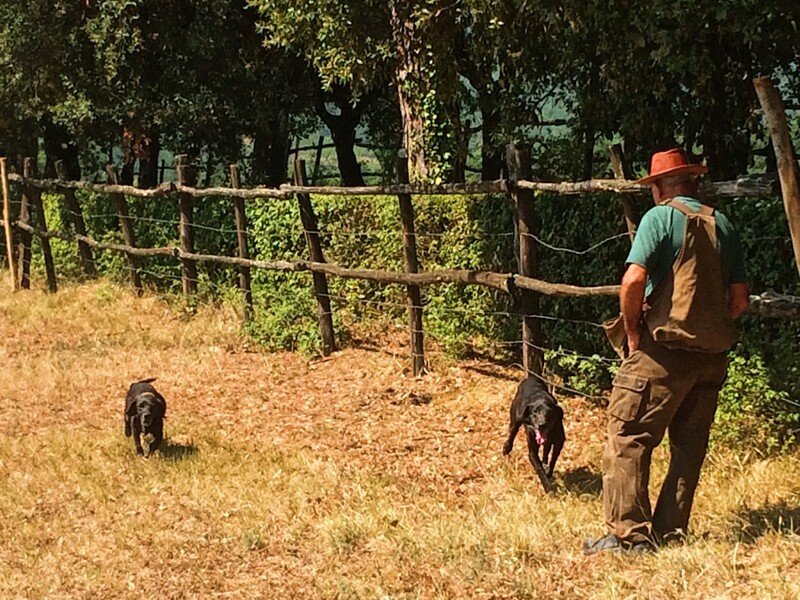 If there was such a thing as a Truffle Hunter Dog Whisperer, his name is Nazareno. Within ten minutes of truffle hunting, the dogs dug up and delivered four gorgeous black summer truffles. And within the hour, nine. 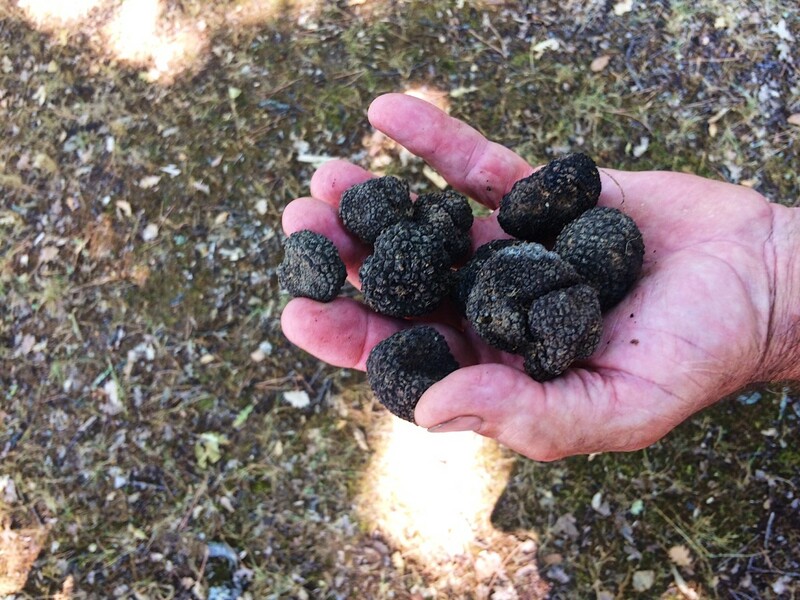 Repeatedly, we brought the black truffles to our noses and breathed in their earthy decadent flavor, foreshadowing the delicious lunch with these black beauties that awaited us. 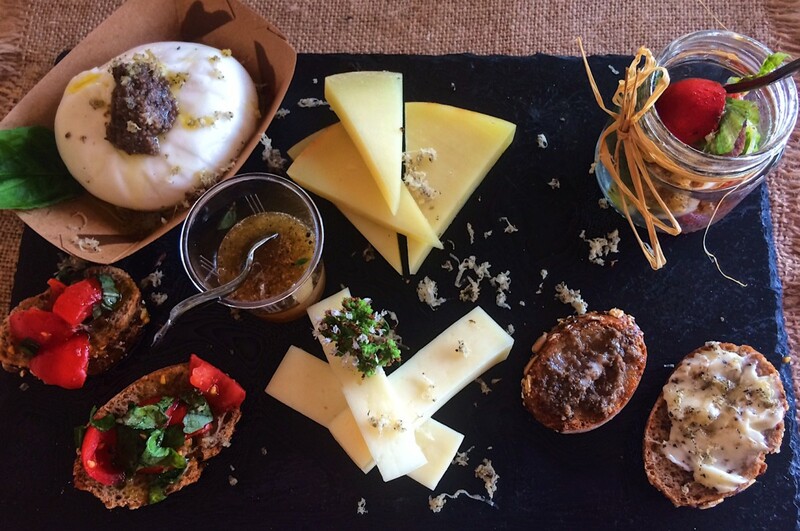 Cristiana lead us to a charming restored horse stable which serves as Poggiovalle&apos;s restaurant. 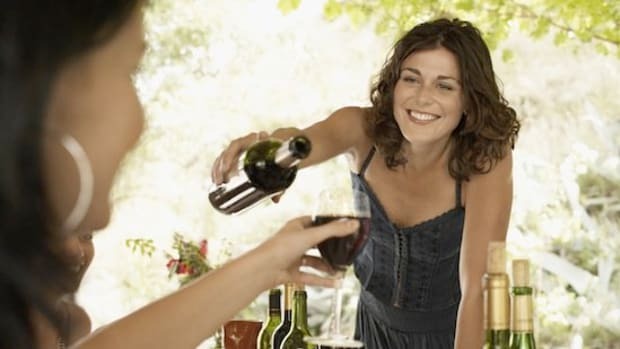 We sat under its covered porch and drank in stunning views of the Umbrian countryside. Then indulged in our Menu Tartufo. The first to arrive was a trio of tiny black truffle-like breaded balls filled with melted mozzarella. Next were flash fried zucchini flowers. At this point, Cristiana gave me a friendly warning - pace yourself. When it comes to eating, I always take an Italian’s advice. Next was a mixed antipasto: mini toasts with creamy butter and truffle with Spanish anchovies, a selection of farm fresh cheese with truffle honey, and creamy burrata drizzled with black truffles. But wait, there&apos;s more. The pasta! 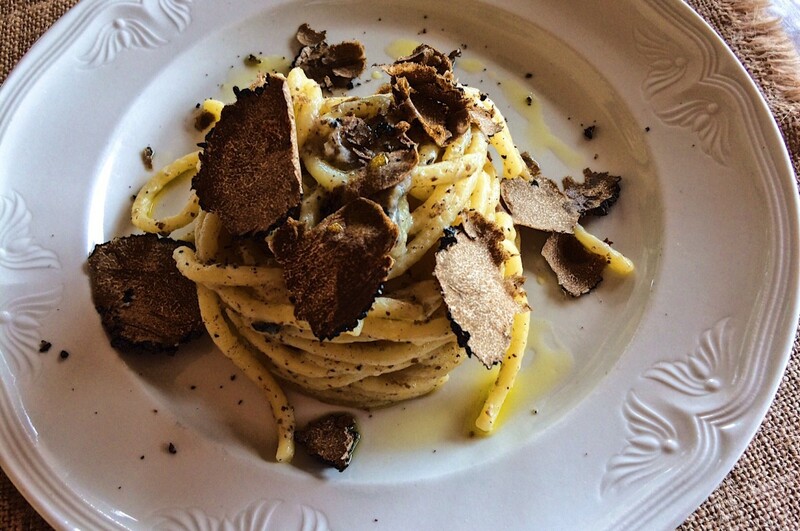 Traditional Tuscan pici was loaded with the black summer truffles Nazarenzo held in his hand just one hour ago. 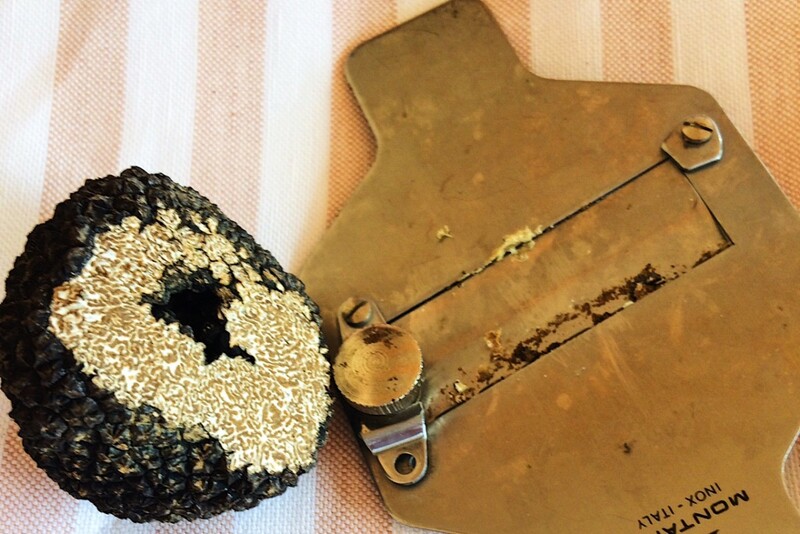 And if I was feeling indulgent ( I was) another black truffle and mandolin slicer lay on the table within arms reach. Can one have too many truffles, that is the question. Today the answer was no. Our pasta primo was not to be outdone by the secondo stracciatella di uova al tartufo (fresh Italian soft cheese with eggs and truffles). Which at that point, I raised my napkin like a white flag and surrendered. After achieving black truffle nirvana, the only heartbreak of the day was that I had to leave my black truffle behind. 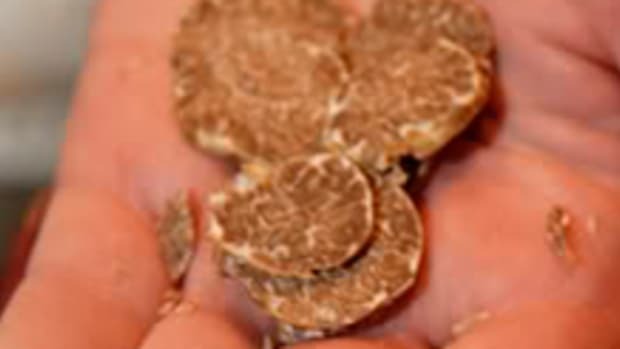 I was flying back to America the next day and as many times as I Googled "can I bring truffles into the USA" the answer was a painful no. I bequeathed my black diamond of the kitchen to my friend with one caveat - when you enjoy it, think of me. 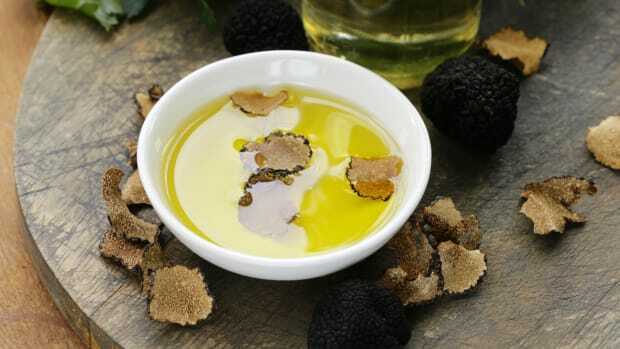 Although parting from my truffle was sweet sorrow, one thought comforted me. I&apos;ll come back in the fall. This time in high boots in the early morning forest mist with Nazareno and his dogs and hunt for the elusive white truffle. 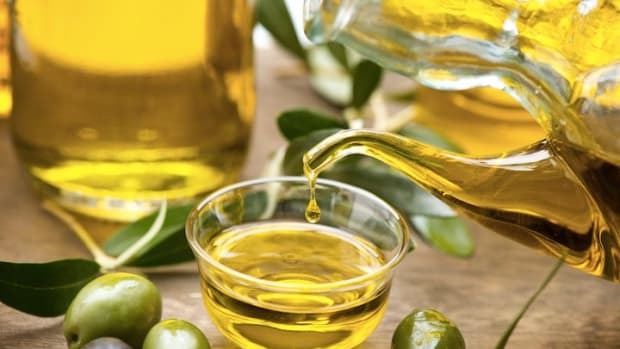 Does Your Truffle Oil Contain Actual Truffles (or Is It Flavored with a Toxic Chemical Instead)?